Are you looking for a paint sprayer for professional use? Then you are in the right place because here we are going to talk about the best commercial paint sprayers currently available on the market. It is highly important to make sure you have got the right paint sprayer. Your projects will only get done the pro way if you’re using highly pro paint sprayers, which are not only budget-friendly but also commercially efficient and effective. Airless Sprayer Vs. Hvlp Sprayers: Which One Is Best For Me? On the top of our list is the all amazing Graco Magnum Paint Sprayer. It is rated to be the best professional paint sprayer of all time because of an incredibly versatile professional design, which makes it a perfect choice for commercial-scale use. Either you are painting a small chair or a whole kitchen this can be your top choice because of its exceptional properties. If you attach a 100-foot hose to this sprayer you can even spray a two to three story house with it. People prefer paint sprayers that are easy to manage and this particular sprayer allows users to clean up easily once you are done with the job. To clean the paint sprayer you can attach a nozzle to your garden hose. This will allow you to clean the paint sprayer easily and quickly. The other advantage that you will be getting with this amazing paint sprayer is that it is a highly durable device that will last long. It is definitely the best option if you have numerous projects coming up in near future. But before that, you should be aware that this paint sprayer has a use recommendation of 125 gallons of paint every year. A perfect choice for professionals, who have regular painting projects that they need to get done within the year. The device comes with an adjustable pressure gauge, which allows you the power to adjust the paint flow. The piston pump that it comes with is stainless steel, which allows you the opportunity to spray un-thinned paint at high pressure. You can connect one or five-gallon paint bucket with a flexible suction tube. It’s also a perfect product for those who want a professional finish to their house while painting the house all by themselves. A perfect commercial scale paint sprayer that is designed for outdoor use. The package accompanies its own cart that allows you to hold up five-gallon paint can. This feature makes it larger and bulkier than other paint sprayers available in the market but it’s definitely going to give you the best results that you have never even imagined to get from a DIY paint sprayer. It is specially designed for people who are looking for high power and efficiency and making it a perfect choice for DIYers too. Since it is a larger paint sprayer, it has a bigger and better motor than most of the compact sprayers available in the market. A larger and bigger motor than non-professional products is going to ensure that the unit will last longer than other products. Moreover, its exceptional ability to allow you to spray undiluted paints makes it a perfect option for you. Coming up to the nozzle it is a lot better than the airless sprayers available in the market. The primary reason is that it can help reduce over spray by up to half. This feature helps to ensure that you don’t get as much blow back while you are working. As mentioned above, this paint sprayer is best for outdoor painting thus; these are the features that you need to look for before buying this paint sprayer. Another Graco product has bagged a position in our top 5 list of the best professional paint sprayers. You can say it is a little brother to the X7 model that has taken up the first spot on our list. This model also comes with a fully adjustable pressure gauge that enables you to modify the suit for any painting job that you have to do. Moreover, just like its elder brother, it can connect to one or five-gallon paint bucket that allows you to have the quick and easy painting. This model allows you the chance to attach a sprayer cleaning adapter to your garden hose which is going to allow you the opportunity for an easy cleanup. A perfect paint sprayer that is ideal for painting your one or two story house. Even if you are looking to paint a building of the equivalent or comparable size then this machine should be your top choice. One of the paramount selling propositions of this airless paint sprayer is that it provides a high threshold for use. Moreover, this paint sprayer also allows you to use 125 gallons of paint through this unit every year, which makes this model ideal for the DIYers who have a lot of painting projects coming up in near future. The only reason that you wouldn’t want to go for this paint sprayer would be its hose length. But this quality also makes it a perfect choice for small houses. The major reason that you would want to go for X5 is that it provides a fully adjustable pressure gauge that quickly changes the dispelled pressure. Its stainless steel pump provides you the chance to spray undiluted paint at a higher pressure. Attach the paint sprayer to one or a five-gallon bucket of paint and start off painting your house with ease. An annual recommended use of up to 125 gallons of paint per year. It can be connected to 75-foot paint hose to clean a one or two story house with ease and in a short span of time. 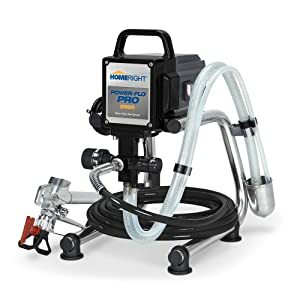 With this paint sprayer, you can use a power flush adapter that is going to allow your garden hose to clean the house or the painting area easily. 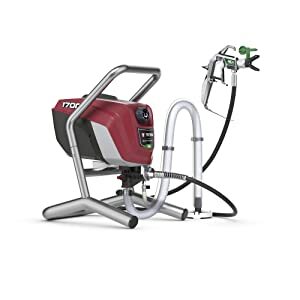 The pack accompanies a stainless steel spray gun, a 25-foot paint hose, a power flush adapter, pump armor storage fluid and an operations manual to allow you to have exceptional painting experience. This is another exceptional commercial paint sprayer because of its sturdiness and strong build. A lightweight yet durable paint sprayer that you have always looked out for is here at your service. The all amazing model gives you 2800 PSI and ½ horsepower motor, which enables it to be used for most of the spraying jobs. Its swivel-tip spray gun and reversible tip allow you to use it easily. Moreover, this feature also enables to clear clogs from the nozzle without any hassle. A strong and portable machine that is extremely easy to clean. The element that makes this model stand out the most from some of the other is the PSI and the amount of horsepower that it brings along with itself. With such a compact design it is the best paint sprayer you can get with all of the added value from the spray gun tip and ceramic inlet valve. These features will enable it to keep working for years to come. It is a powerful paint sprayer that can deliver up to 2800 pounds per square inch of spraying power. It has a robust ½ horsepower that gives it enough propulsion while you are painting. The airless paint sprayer can be positioned on sturdy legs that enable you to give more stability. The paint sprayers can spray nearly one liter of paint per minute with a 515 sprayer tip which allows you to prevent clogs. The machine also comes with an adjustable pressure gauge that you can use to adjust your sprayer according to different situations quickly. The ability to attach to one or five-gallon paint bucket makes it a perfect choice for all the pro paint lovers. Another amazing paint sprayer on the market has bagged a position on our list of top 5 best commercial paint sprayers. This is a portable and powerful paint sprayer that you would not want to miss out. The paint sprayer is attached to a durable cart. The cart comes with durable heavy duty wheels allowing this paint sprayer to carry anywhere you want. It comes with an adjustable handle that can be easily changed to the height of the painter who is using it. A more compact model than all the models we have reviewed above. The paint sprayer allows you to attach up to feet hose which is a unique feature and currently it is not available in the models that we have looked so far. The paint sprayer still gives you a decent amount of length for most painting jobs. The major highlights of this paint sprayer are its durable construction and powerful motor. If you are looking for such features then do not hesitate to get it for yourself and to get your painting job done the pro way. Furthermore, the portability, adjust ability that this sprayer provides makes it a perfect choice for painters who have to move around a lot while painting and need to adjust the height of the paint sprayer while painting. Its incredible ability to provide you a smooth and steady flow of paint through the sprayer at 3.5 gallons per minute makes it a perfect choice for painters. It is a versatile, commercial grade spray gun which can use up to the 50-foot hose, which gives you a decent amount of length and range for most painting jobs. It can be attached easily to a mobile cart or dolly and has an adjustable cart handle which allows you to adjust the cart to your height. The powerful industrious wheels on this paint sprayer also make it extremely easy to take it along anywhere. Both these sprayers are used for thin paint jobs such as automotive, lacquers, etc. These sprayers have fairly small paint reservoirs attached to the gun. These paint sprayers are used in a controlled area such as paint booth with proper ventilation. Airless sprayer uses a high-pressure pump to push paint through the hose gun. They can be easily controlled and deliver a reasonably good pattern. These paint sprayers are perfect for a DIY job, but the professional standard paint sprayers come with a lot more qualities that you might not find with an airless sprayer. It is so because professionals need a perfect finish to their product that an airless paint sprayer can’t provide. There is lots of confusion and fuss about both of these kinds of paint sprayers, let us give you a clear perspective on both so that you make a best buying decision. An airless sprayer is generally used for jobs such as painting a house or fence, or something of that nature. It is a high volume tool that is going to provide perfect results, but the finish may differ when it comes to small jobs. This paint sprayer is usually used to take care of smaller, more personalized jobs, like painting shelves or furniture. This paint sprayer is recommended for a carpenter or woodworker that wants to make sure their final product looks as good as possible. Now match your requirements with the ones listed above and decide the one that best suits you. Since there are numerous paint sprayers available in the market, if you follow our guidelines mentioned above and reviews, you will surely become a DIY paint professionally and can resolve paint related issues all by yourself, even for your more significant projects. Here is our detailed review of top five best commercial paint sprayers. This is definitely going to give you a better understanding of the features that you need to look in a professional paint sprayer. Moreover, if you intend to buy paint sprayer from the list above then you would be sure that what features you will be getting with it. So hurry up and decide your paint sprayer from the list above right away so that you can start off your painting task right away. The article also highlights the positives of paint sprayers that make it a perfect choice for your painting tasks, so that you don’t feel confused or indecisive and can get your job done easily and happily!